My dog was out playing and came in rubbing at her eye. I found a piece of fishing line in her mouth and when I looked at her eye, there was a tear above her cornea on the white - red but not bleeding. What treatment should I use to ensure that she does not get an infection? If the cut on your dog’s sclera (that is the official name for the “white” of the eye) is not too severe, it should heal on its own. To prevent infection, your veterinarian will prescribe antibiotics, either in the form of drops or an ointment. Oral antibiotics might be needed as well. All of these medications are available by prescription only, so you will need to take her in to the vet’s office. Do not be tempted to use a “leftover” eye ointment that you might have lying around. If it contains a steroid, it could make your dog’s eye worse rather than better. Apparently antibiotics can also cause an issue with the unborn pups. Topical dog eye medications should be safe for your dog and her unborn pups and even some oral antibiotics (Amoxicillin, Clavamox, Cephalexin and Baytril) shouldn’t cause any problems. Of course, these are only indicated if there is a chance of saving her eye. Surgery is not out of the question during pregnancy either. With proper anesthetic choices and monitoring, mom and the pups should come through without any problems. If your veterinarian is not comfortable treating your dog because of her pregnancy ask him if he can refer you to someone who is set up to deal with her special needs; a veterinary ophthalmologist might be best. 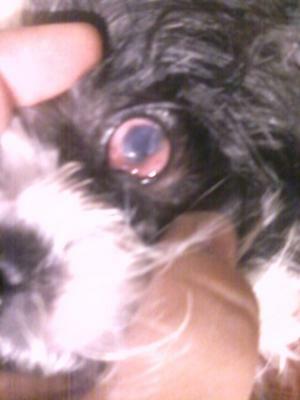 My shih tzu has injured her eye somehow and I am not sure what to do for her. We cannot afford to go to the vet. At one point it looked as if there was something sticking out of her eye. Now this is what it looks like with the picture. I am worried about her and I am not sure what to do to make her feel better. I’m sorry to hear about your Shih Tzu’s puppy eye problems. Unfortunately, I can’t get much of an idea of what might be specifically be going on from your picture, but it does look as if her eye is severely affected. It really would be best if you could get her in to the vet’s office. Many veterinarians can help during a financial crisis by setting up payment plans, arranging for a line of credit, or they may even have a fund set aside for cases just like yours. If you absolutely cannot get her in, the only safe thing to try at home is to flush out her eye 3-4 times a day with an unmedicated eye wash and then to gently apply a lubricant like GenTeal PM Eye Ointment. Without examining her eye, I’m afraid anything else that I might recommend could make the situation worse rather than better. My dog was playing with his brother and his brother's paw caught him in the eye scratching it. The eye is very red on the side and appears to be bleeding out or tissue has built up possibly. The other eye is all blood shot and he cannot open his eyes very well. He doesn't want to eat and is very weary of coming near you to be petted. We are unable to get to the vet over the holiday weekend and the closest vet is 3 hours away. It is possible that your dog’s eye has ruptured or is otherwise severely damaged. He definitely needs to get to the veterinarian and the sooner the better. I’m afraid there isn’t anything you can do for him at home. I’m even leery to recommend any pain relief at this point since he is not eating and this increases the risk that he could have some serious side-effects from these medications. Best of luck with the dog eye injury. I know for a fact that any eye injury, be it minor or major, one has to visit a vet. Just be sure the vet is a competent and skilled one. Had an unfortunate incident where my 4 legged baby almost lost his eyes because the vet in the clinic is an unskilled and ignorant one. First sign that he is incompetent??? He asked us to go back after a month. Huh! This unskilled, incompetent vet specialty is poultry..No idea what he is doing in a vet clinic. take him to a vet now! emergency clinic NOW...no matter how far you have to drive!